Truly the lesser of two evils? Does Hillary Clinton face enormous amounts of misogynistic abuse? Without doubt. Is this a major issue? You betcha. The rhetoric that has been lobbed at Clinton in this election cycle, and back in 2008 as well, by both the left and the right is reprehensible in the extreme and needs to be countered in every instance. It is damaging to women everywhere, working to preclude eligibility to the highest office in America, and by extension, one of the most powerful positions in the world, purely on the basis of gender. Attacking Clinton on this level has rippling effects that reach far beyond this single presidential race. This is not to say, though, that Hillary Clinton merits the Presidency. Her attackers may couch their positions in sexist rhetoric, and their aims are betrayed by this, but attacked she deserves to be. What are the crimes of Donald Trump? Unscrupulous business practices, likely tax evasion, the whipping up of racial animus the likes of which haven’t been seen in a generation. These things have palpable, real consequences – hundreds of lives worsened or ruined, scores of individuals suffering physical assaults, businesses that people looked to for their livelihoods ripped apart. Donald Trump, while not a fascist in the ways we have known before, is a reckless, dangerous cretin, and to allow him access to the powers associated with the Presidency would be a grave mistake. What we have seen of him thus far, his blundering unpredictability, should give us pause. How does Hillary Clinton stack up in comparison? The prospect of a Trump presidency is one that is all the more frightening for its mystery – we don’t know what he’d be able to achieve, how much damage he would be able to inflict. On the other hand, we know exactly what will come of an HRC presidency. She’s held enough high offices, been close enough to the power structure of the US now, for decades, to allay any questions one might still have. Hillary Clinton is a murderous, corrupt, racist neo-con, and a presidency with her at the helm will be a continuation of the current murderous, corrupt, racist regime we’ve had for decades. The damage that Donald Trump has been able to inflict upon the world pales to insignificance when compared with that of Hillary Clinton. When Secretary of State in 2009, Clinton supported the vicious military coup that toppled the democratically elected government of Honduras, legitimating the violence and internationally-maligned illegal conduct of the actors. In the wake of this, violence against LGBTQ people has spiked, the economy has tanked, and organised crime has seized control of ever more of the country. Hillary Clinton has been hawkish for her entire political career – her opposition to regime change in Haiti in ’94 came not because she was averse to needless death but because the effort was ‘too disorganised.’ She voted for the war in Iraq in 2002, quibbling over her motivations only after the whole thing came apart at the seams. 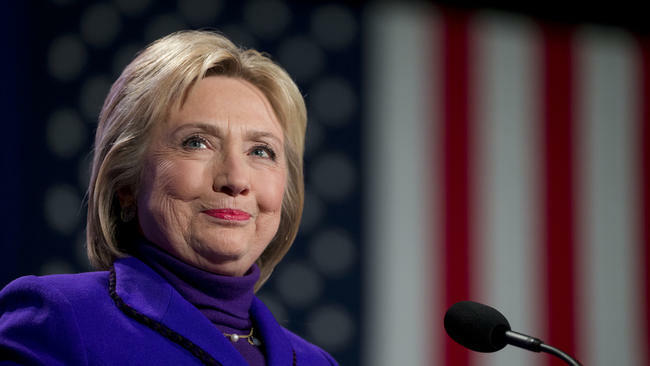 At the time, she vocalised her support for that most-American of policies, gunboat diplomacy: “I believe in coercive diplomacy.” Despite paying lip-service to not involving America in Pakistani engagements , the drone-strikes that have killed thousands of civilians since 2008, all reservations evapourated upon being confirmed Secretary of State. She was a proponent of the surge of troops in Afghanistan under Obama and was for regime change in Libya. In Syria, she has been a supporter of dumping ever-more weapons into the ring, supposedly to aid the ‘moderate’ militias, in truth untraceable once they touch ground. It is plausible that a Clinton Presidency will raise tensions with Russia to the point of disaster. Racism, particularly against blacks, has been woven into the cloth of America from its start. That said, it was the policy choices of the Clinton administration in the 90’s that set the scene for the current rash of institutionalised violence playing out now – with 102 unarmed black people murdered by police in 2015, and, at last count, 36 this year. Adding those that were armed with anything deemed a ‘weapon’ causes both numbers to multiply steeply. The heightening of the racist war on drugs, the implementation of the fundamentally flawed 1994 crime bill, the scapegoating of urban ghettos and those forced to live in them as source of all of society’s ills – these actions have brought America to where it is today. And Hillary Clinton, with her talk of young, black “super-predators” vocally supported it the whole time. While it was Trump that took ‘the Birther Movement’ to it’s farcical extremes through Obama’s two terms, but it was her campaign in 2008 that sowed the seeds of distrust, questioning Obama’s status as an America. We saw the same tactic used this primary season, with the Democratic National Committee – which we know to have been in cahoots with Clinton’s team due to leaked emails – actively triangulating to undercut Bernie Sanders on grounds of his Jewishness and his atheism. Clinton has shown again and again that she is shameless in her use of racist rhetoric to achieve her aims. Trump, with his “small loan of a million to get on his feet,” his multiple bankruptcies, his dozens of failed businesses, exemplifies what it means to be part of the moneyed elite. His conduct, the fact that he is not held to account, is symptomatic of the state of American capitalism in the 21st century. It is Hilary Clinton, though, who is complicit in the creation of this situation. Clinton has been the tool of Wall-Street for decades, participating in the repealing of the Glass-Steagal Act in 1999 that lead directly to the financial crisis and world-wide economic recession of 2008. She has opposed efforts to reinstate it and has said that she will not do so if elected president. In what has quickly become the take-away soundbite from Monday’s Presidential Debate, Clinton reeled off a list of her undoubtedly impressive accomplishments when questioned by Trump on her stamina. It is true, she is possessed of a strong fortitude, especially when we recognise that she has risen to her position in a system stacked against her as a woman from the start. But as we can see from the sample above, it is just these accomplishments that preclude her from deserving the Presidency. Or would do, if it were not the case that, in this day and age, the division of the American people, the grovelling abetment of the moneyed, the callous interventions into other nations’ governments is exactly what the President is meant to do. Hillary Clinton, scion to war-criminal Henry Kissinger, canny fixer for Wall Street, inveterate racist, would, in any other pairing, be without doubt the villain. It is a sorry state of affairs that she looks the lesser of two evils. Gatiss, what have you done? It’s a hackneyed turn of phrase – we’ve all heard it, whether directed at ourselves in moments of deep personal opprobrium, or, later, jesting with friends, bonding over the fact that we are all of us imperfect beings – but, Mark Gatiss, I’m not even mad. I’m disappointed. 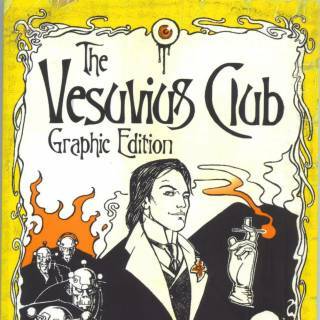 I picked up The Vesuvius Club: Graphic Edition from the local library a while back. The comic version of Gatiss’ 2004 novel of the same name, the work is a condensed version of Gatiss’ text coupled with Ian Bass’ art. Black and white, the depiction is a blend of real-to-life and caricature, stark lines with negative space in solid fill. Far from the worst I’ve seen, it remains perfunctory – there isn’t much here that benefits a second viewing; it’s all surface. The volume covers a single arc, and runs to 100 pages, as well as character splashes and newspaper-style adverts on the inside covers. It’s here that the frustrations set in. 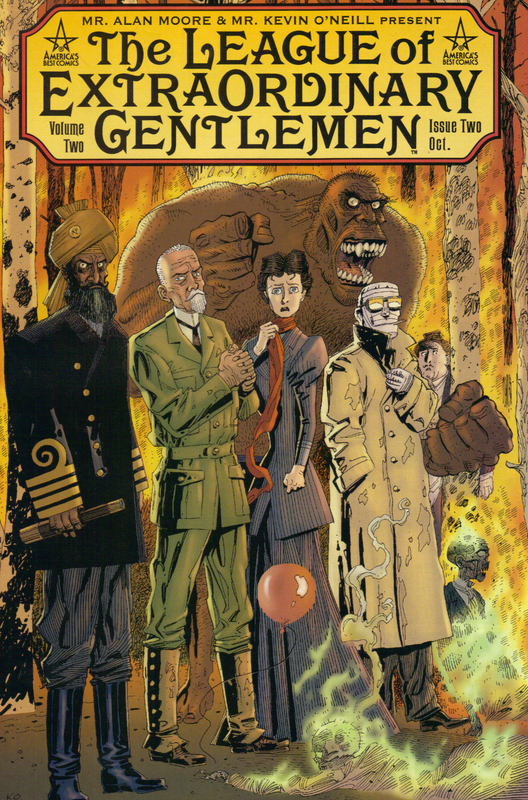 The design, at least to my mind, sets you up for something similar to Moore and O’Neill’s The League of Extraordinary Gentlemen – both series cover the same period, the late Victorian/Early Edwardian, both have a puckish reverence for the aesthetics of the era, both blend the mundaneity of the period with the fantastical. It’s a bit of a difficult comparing much of anything in comics to Moore’s work – there is almost always a clear divide in quality, in depth, in novelty, etc., etc. What little I’ve read of Gaiman’s work sometimes comes close, but I’ve seen little else. Which is all to say that it might be a little unfair to compare this, an adaptation of a work, from a writer of various media, to that of a focussed effort from a master of the form. The failure to achieve greatness, however, is not what I’m so frustrated by. Better story. Better art. Better politics. Moore, as a story-teller, is definitely not without fault, and League, for all it’s depth and detail, is a flawed work that, at least in the main run, collapsed under its own weight. While clearly riffing off the period each issue was set in – it was, after all, an effort to blend all of literature – the whole arc was steeped in Moore’s particular style of progressivism. Though the characters themselves may have been constrained by Edwardian values, the narrative itself didn’t play to those rules – indeed, so much of the story is driven by Mina Harker’s efforts to assert herself in a “man’s world” playing a “man’s role.” When odious, racist depictions surfaced, they were almost always undercut and inverted; acting, rather than as signifiers for themselves, to show off why these caricatures were wrong in the first place. To its benefit, Vesuvius is not totally without this – the protagonist is bisexual, and one of his accomplices gay, and this is not treated as morally reprehensible by the tone of the narrative, if not always their fellow characters. However, I fear that Gatiss may have played it too straight in his appreciation for and representation of mores of the period. Characterisation of other elements in the story are lifted almost whole-cloth, without any evidence of satire or nuance, from the racist and bigoted tropes of the era. There is a stereo-typical ‘mandarin’ looking awfully a lot like something Mickey Rooney may have played who, inevitably, runs the Opium Den, and then the villain, in the reveal, turns out to be a transvestite. And mad. ‘Cause nothing’s more twisted and evvilll than a mentally distressed person with a penchant for women’s dress. Cultural appropriation is a hot topic in the literary world at the moment, what with Lionel Shriver’s recent key note pushing back against what she feels is political correctness gone mad, and the inevitable blow-back she received as others circled the wagons (for my part, I think both parties are wrong). Vesuvius, though, is obviously not a case of appropriation as much as it is stale tropes that were rankly offensive when they first surfaced, let alone more than a century later. What is worse is that we all know Gatiss is better than this – his work in Doctor Who and Sherlock (“The Abominable Bride” aside…) are some of television’s better efforts, so it’s not as if the man is a serial offender or endemically prejudiced. I can only hope that this is a singular misstep in an otherwise reputable career. Evidently Vesuvius has been in production for the small screen for a while. Hopefully they clean it up a bit.